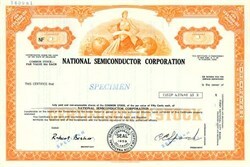 Beautifully engraved SPECIMEN certificate from the National Semiconductor Corporation. This historic document was printed by the Security-Colombian Banknote Company and has an ornate border around it with a vignette of an allegorical woman holding a long sheet of paper with a globe on each side of her. This item has the printed signatures of the Company's President ( Charlie Sporck ) and Secretary and is over 35 years old. National Semiconductor started by making silicon mesa transistors for industrial and military uses. The company grew quickly after 1967 under CEO Charlie Sporck and new management, moving headquarters from Danbury, Connecticut, to Santa Clara, California in the heart of today's Silicon Valley. National Semiconductor is the premier analog company driving the information age. Combining real-world analog and state-of-the-art digital technology, the company is focused on the fast growing markets for wireless handsets; information infrastructure; and display and imaging technologies. National has a rich portfolio of intellectual property along with the system expertise to leverage its analog technologies to develop highly integrated products for a broad range of applications. Our chips power mobile and cordless phones, wired and wireless local area networks, advanced displays and imaging applications, desktop, portable and thin-client computers, and a host of other types of electronic devices. National's strong base of analog and mixed analog and digital technologies enables it to provide optimum system solutions by evolving and integrating its basic building block circuits into standard chipsets tailored for specific applications to highly integrated full system solutions. Most of our products are no bigger than a thumbnail, yet contain a cityscape of circuit lines hundreds of times finer than a human hair. National has manufacturing sites around the globe. Its wafer fabrication facilities are located in Arlington, Texas; South Portland, Maine; and Greenock, Scotland. Test and assembly sites are in Melaka, Malaysia, and Singapore. The company is focused on analog-based semiconductor products, which include stand-alone devices and subsystems in the areas of power management, imaging, display drivers, audio, amplifiers and data conversion. The company targets key markets such as wireless, displays, information infrastructure and a broad range of portable applications. Our chips power mobile and cordless phones, local area networks, and a host of other types of electronic devices that bring people The Sight and Sound of Information. We support worldwide mobile phone standards, including GSM, CDMA and also the DECT cordless standard. Here again, our analog and mixed-signal expertise is the underlying element that makes it possible to offer our customers complete wireless solutions for products in both the global mobile phone and cordless phone markets. Key contributions include our PLLatinum� family of phase-locked loop frequency synthesizers, as well as highly efficient power management, interface, radio transceiver and audio products. And, for base stations, our powerful new LVDS (low voltage differential signaling) technology will be used in the third generation of cellular communications base stations. Displays, Imaging and Human Interface Keyword: thin. Today's mobile users demand ultra thin, lightweight flat displays and touch sensitive screens with uncompromising brightness, color and sharpness. Our analog and mixed signal components are critical to making these innovations a reality. National's drivers and buffers bring bright images to the screen in monitors, as well as displays for laptops, notebooks, handheld PDAs, games, camcorders, digital cameras and telephones. Working with Samsung Electronics we created a new de facto standard for next generation flat-panel displays using our new RSDS (reduced swing differential signal) technology to improve performance while substantially reducing power consumption, weight and costs. 1999 Exited the PC processor business to sharpen focus on integrated solutions for the Information Appliance market. Introduced Geode SC 1400 prototype processor, the world's first Information Appliance on a Chip, as the first member of the Geode family of solutions for the Information Appliance market. 2001 Announced, with IBM, new technology for the joint development of home gateways. National acquired Wireless Solutions AB, and InnoCOMM Wireless. Announced a complete Bluetooth� solution for wireless communications.